PidginSnarl is an extension/plugin for the very popular instant messaging client Pidgin. It shows you many different notification types for actions taking place in Pidgin. 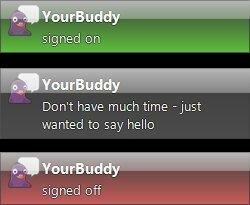 Some examples are getting notifications on buddys signing on and off, incoming chat messages or authorization requests. The notifications are displayed using the general notification system Snarl (Windows only) which gives you many option how the different notification types shall be displayed (it features many different styles and schemes, you can define the timeout for the display or play a notification sound – all this configurable to a per alert class level). There are even styles available that push the notifications to your iPhone or Tweet it to your Twitter account.